Hello! 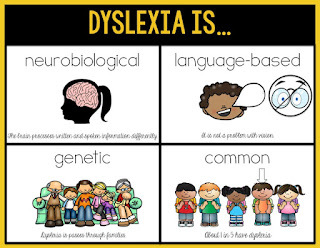 I'm finally writing about my most passionate topic in education: Dyslexia. There is a long story as to why and how I became so interested, but basically we ALL need to know more about it. This will be part of a series of posts about dyslexia because there is SO much to share. I thought I'd start with the myths and misconceptions because there are so many out there. In order to understand what dyslexia really is, we need to know what it is NOT. This is the most common thing that I hear, tied with the next one. 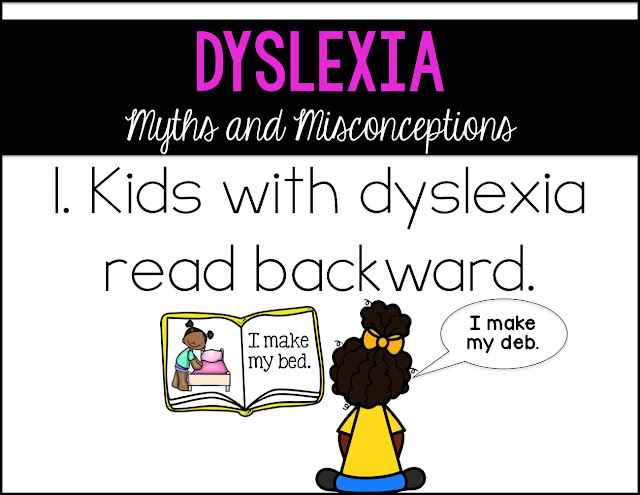 Here's the truth: Dyslexics do not see things backward. 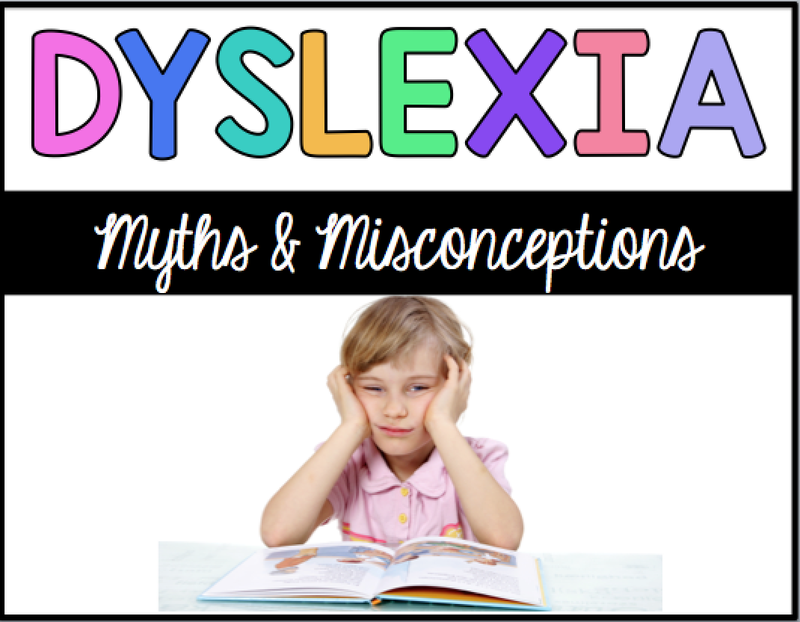 Dyslexia is not a vision problem that can be solved with vision therapy. 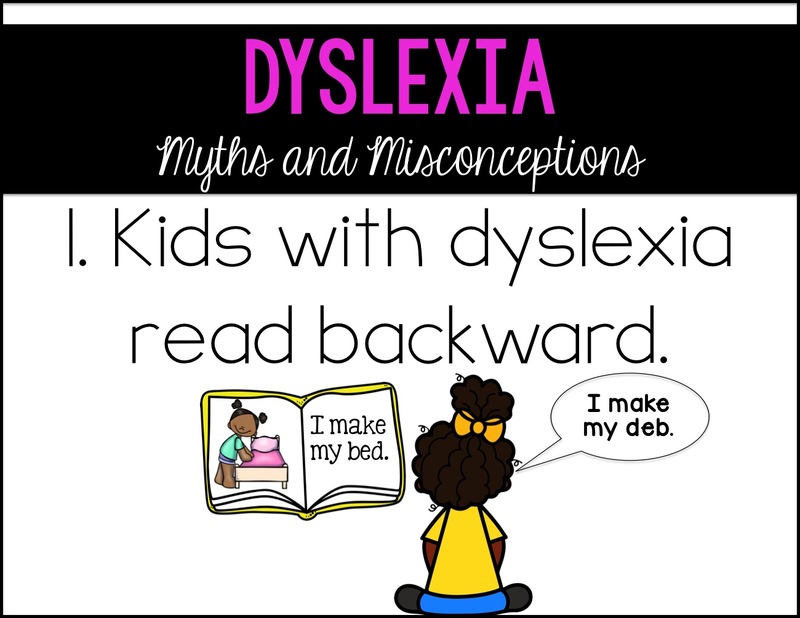 There is actually no evidence that suggests that dyslexics see things backward. There IS evidence that dyslexics have trouble processing and manipulating the sounds in words. 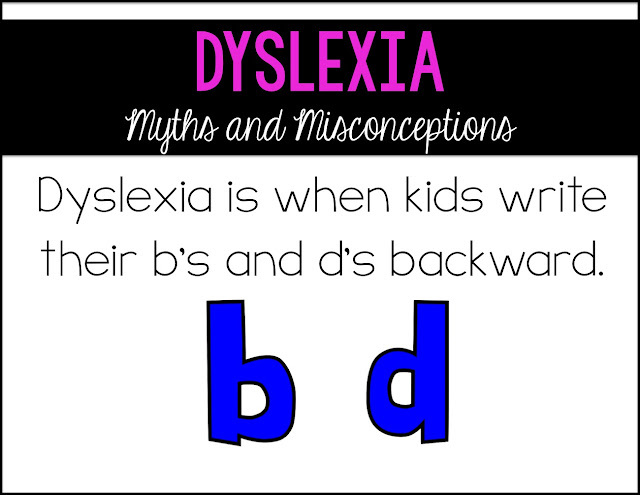 So why do so many dyslexics reverse b's and d's? First of all, reversals are normal through first grade. Beyond that, it may be a red flag. Secondly, not all dyslexics have issues with reversals. Yes, I would say it is a common correlation, though. Just be careful not to define dyslexia as a "reversal thing." Reversals are actually the result of the brain trying to process directionality. Before kids enter school and start learning to read, they are surrounded by objects that are still those objects no matter which way you turn it. For example, their favorite stuffed bear is still a stuffed bear no matter which way you turn or flip it. My hero, Barbara Steinberg, gave the example of a chair. When you flip it upside down, is it still a chair? Yes! If you turn it to face you and then turn it so it's not facing you, is it still a chair? Yes! How about a "b"? If you flip it, is it still a "b"? No! Letters are the first time we ask kids to notice that directionality. They need to train their brains that a circle and a stick can be a b or a d or a p or q based on which was its oriented. Some kids can do this quickly and it takes other kids longer. 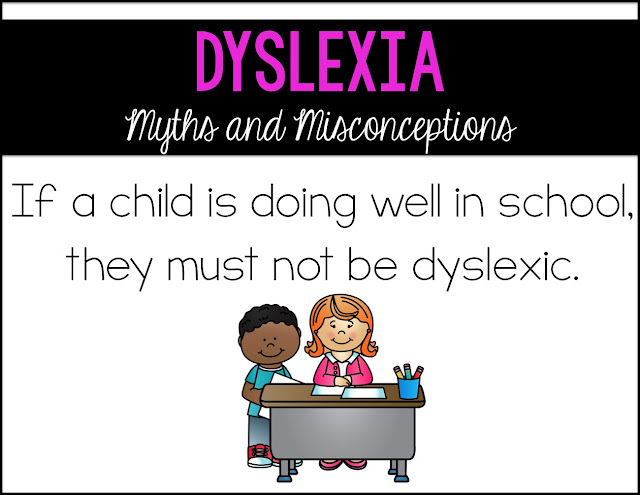 So yes, there are many dyslexics who have a hard time with reversals, but there are many who do not. 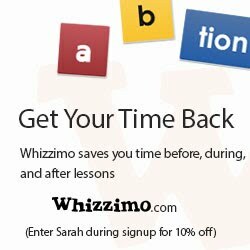 Reversing letters is actually a normal part of development through 2nd grade. 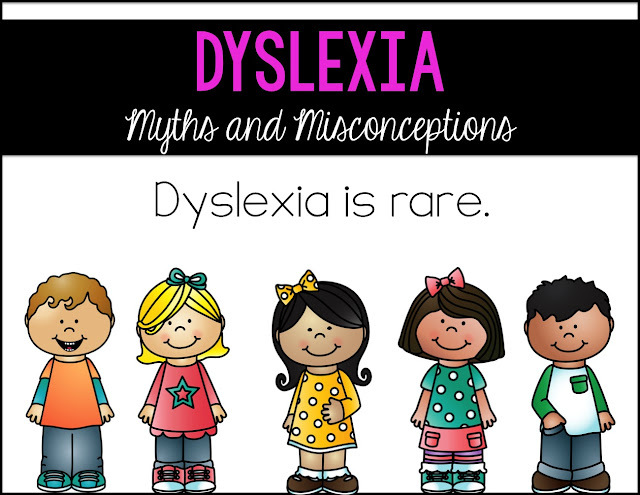 Many kids without dyslexia reverse letters and many people with dyslexia don't reverse their letters. The letters b, d, p, and q are really all the same letter just flipped and turned. We see the letters as being in different positions and directions. Kids learning to read don't always see this. Direction doesn't matter with other objects in a child's life. The best example I've seen is that a chair is still a chair no matter which direction you put it. Letters change based on their direction. This can be confusing for kids who don't have that letter firmly imprinted in their brains. It is true though that children with dyslexia continue to reverse letters longer than other children. If there is one myth I'd like to debunk, it's this one. 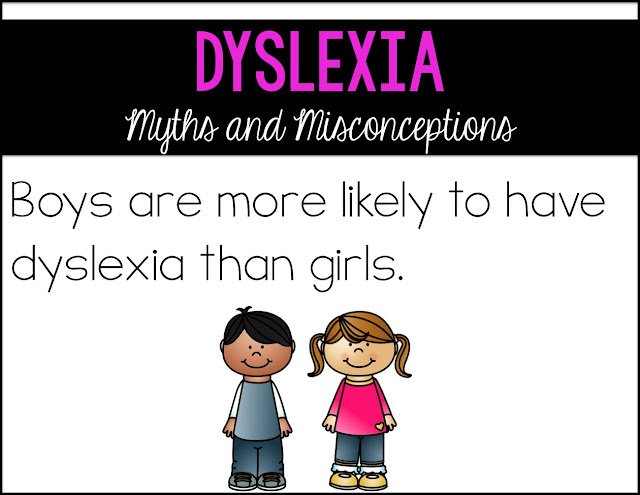 Fact: Kids with dyslexia have average to above average intelligence. Fact. That's why as teachers we are often left scratching our heads trying to figure out why our bright students are having so much trouble learning to read. When I think of my dyslexic students, I think of bright, hardworking, and creative kids who have a specific hardship: reading and spelling. Lack of effort?! HA! My dyslexic students work the hardest, hands down! Why? Because they have to. They are compensating both on a conscious and subconscious level (their brains are literally compensating by using another part of the brain, which is less efficient.) It is a neurobiological disorder- the problem is physically in the brain. It is NOT a result of lack of effort OR less exposure at home. Lack of exposure at home is a whole different issue that also affects reading ability but it is not a cause of dyslexia. Parents can experience a lot of guilt when they shouldn't. Kids experience shame, when they shouldn't. A lot of that has to do with misconceptions and misunderstanding surrounding dyslexia. 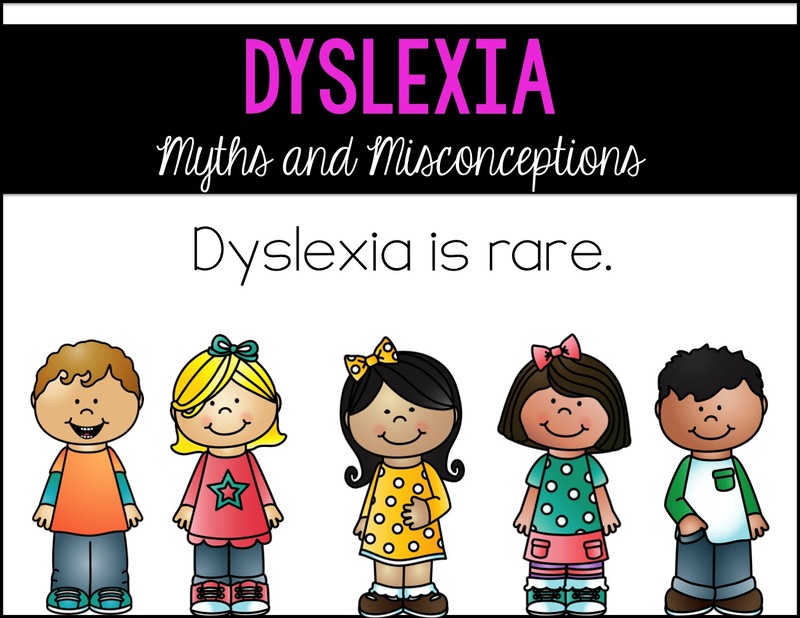 Dyslexia is a lifelong learning disability that cannot be "cured." A dyslexic can learn to read with the right systematic and explicit instruction though. New research shows that boys and girls are equally affected with dyslexia. A theory is that more boys were identified because they tend to act out when they are experiencing difficultly, whereas girls try to compensate for and hide their difficulty. Kids are really good at compensating. Some dyslexics may get decent grades but they are working SO hard. They are smart after all. I will be posting again soon about the signs of dyslexia. Typically, kids are identified later because they hit that "3rd grade wall" when the words get much bigger and texts longer. Their coping mechanisms don't work as well. However, we don't need to wait that long- and shouldn't! Let me be the first to throw myself under the bus. I have waited. I have said to parents and myself, "I think it will click. Let's just wait and see." Signs can be seen as early as kindergarten. 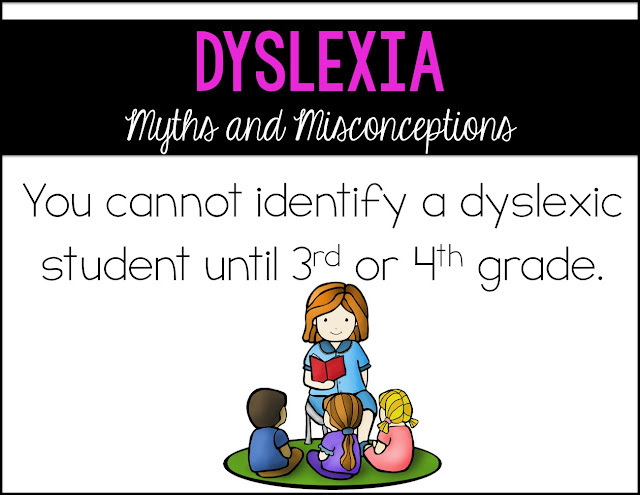 You may not be able to identify if a child has dyslexia, we can identify if they are "at-risk." 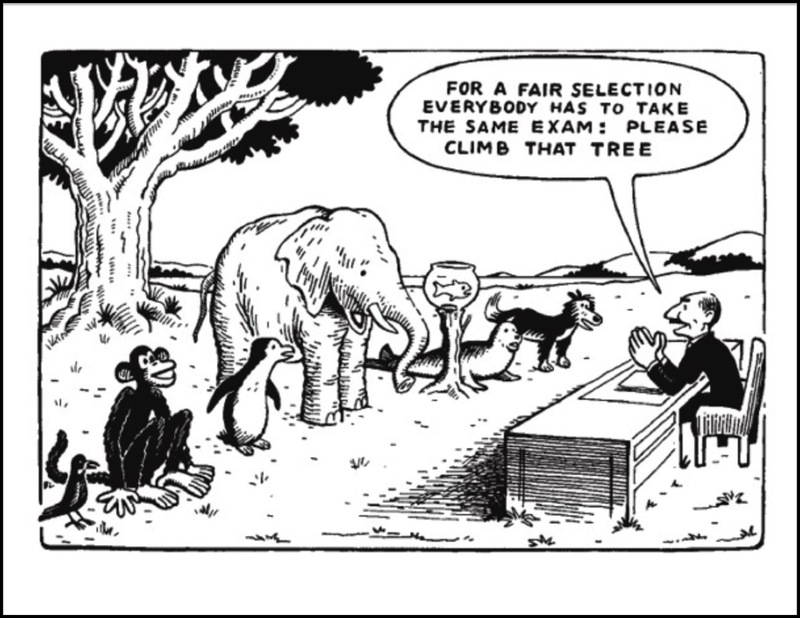 Dyslexics can be identified using assessments administered by trained and experienced specialists. Trust me, the sooner a child is identified, the quicker the child can get help, and the more likely they are to experience reading success. NOPE! It is not rare at all. In fact, 1 in 5 have dyslexia. ONE in FIVE! So, if you have a class of 20, that's 4 kids. What's tricky is that there is a huge spectrum with dyslexia. 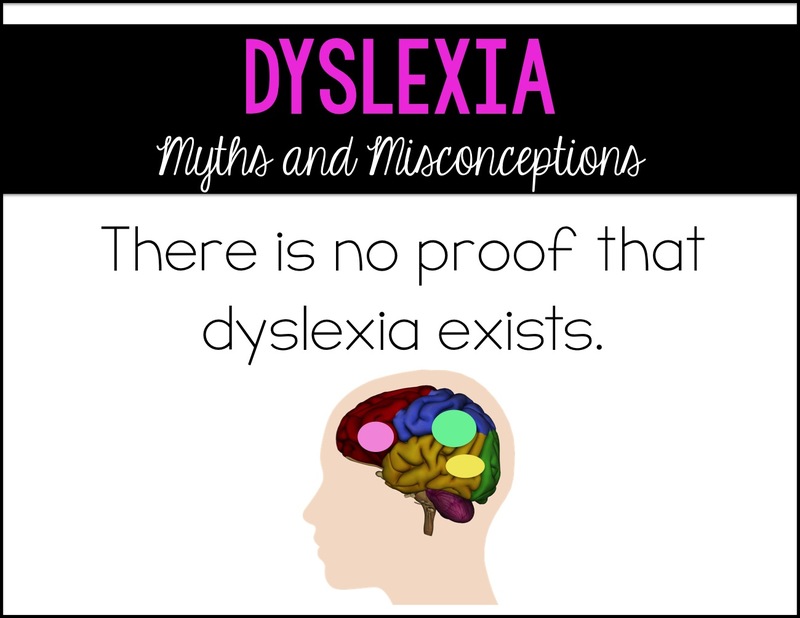 Some kids are profoundly dyslexic, while others are mildly dyslexic. Obviously the profoundly dyslexic students are easier to spot. It's the mildly dyslexic kids that tend to get overlooked. They are the ones we tend to make excuses for- lack of effort, laziness, not enough exposure, "not ready yet," etc. Another mistake I've made is to just assign reading, reading, reading to my dyslexic students with the hope that the more they practice, the better they will get. 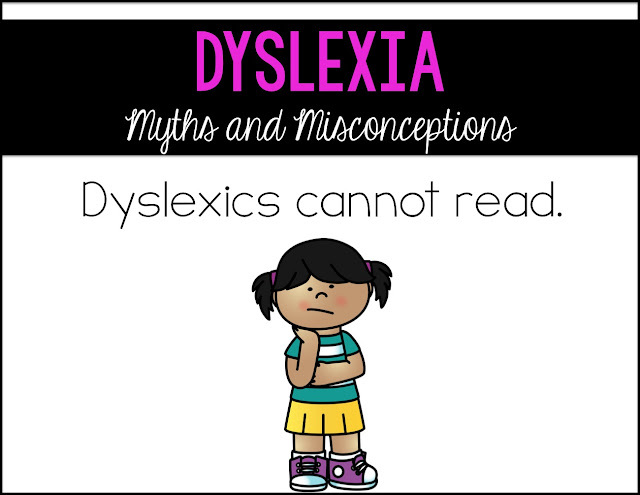 Research shows us that dyslexic students need proper instruction to improve their reading skills. We can't just ask them to read more for homework and hope that will solve it. 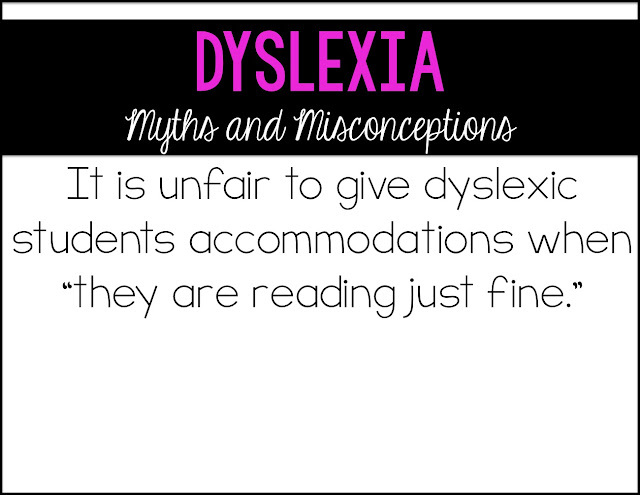 Silent reading for dyslexics can lead to more guessing, and errors left uncorrected. This will not help his reading development. Just to be clear, these kids DO need to be reading, but it should be the right texts with the right instruction. More reading does make us better readers, just not on it's own. 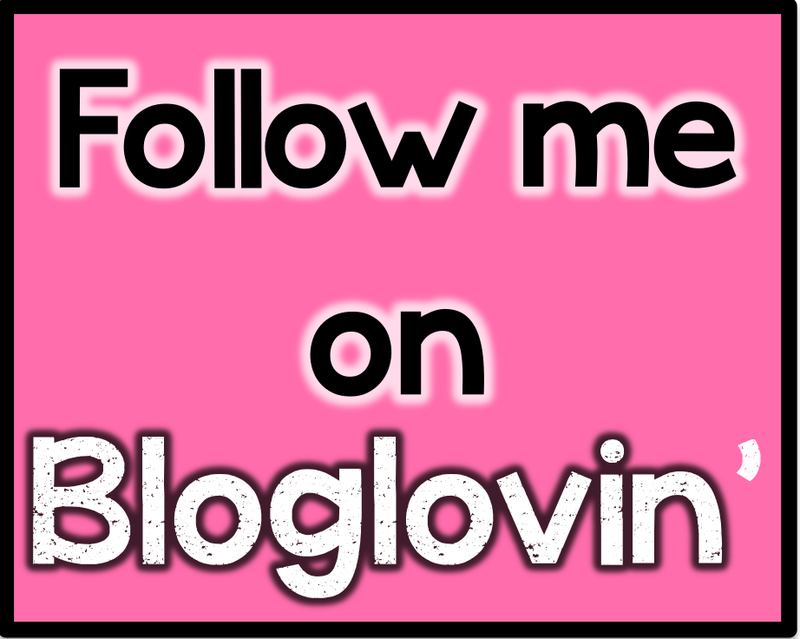 :) Another important note that I will be bringing up in another post more in depth. 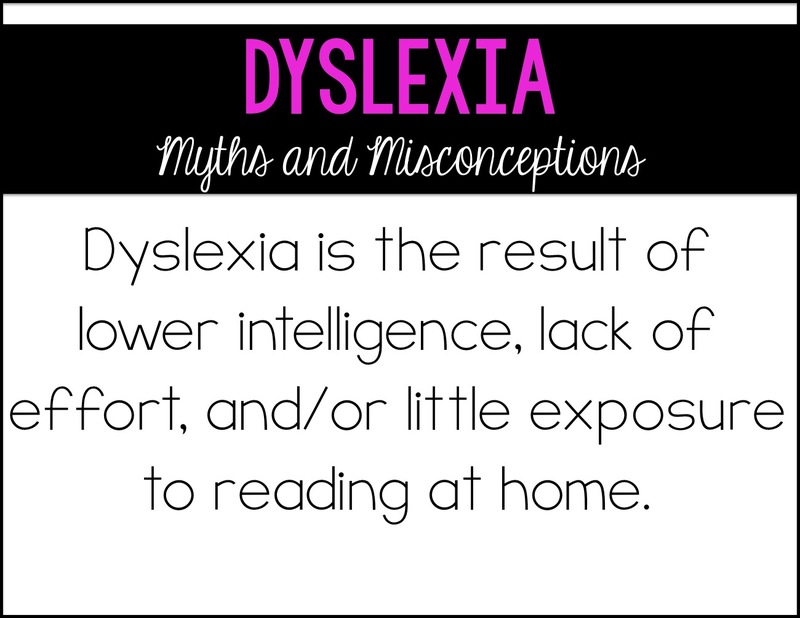 Dyslexic kids DO need intervention at their reading level BUT they also need exposure to texts at their intelligence and maturity level. This means they need to be read aloud to and have access to audio books- the same books that their peers are reading. We still want to challenge these students. They are bright, curious, and ready to learn! Giving them access to texts at their intelligence level allows them to grow their vocabulary and comprehension skills, not to mention their general knowledge. A mistake I've made is only giving kids books at their level. We need to make sure we are doing both. Actually there is a ton of research out there! 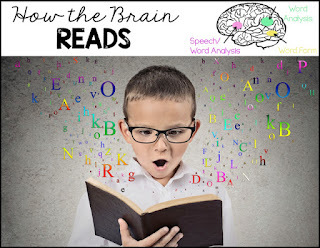 Thanks to fMRI's, there are actual pictures of the brain, showing which areas of the brain are activated while reading. 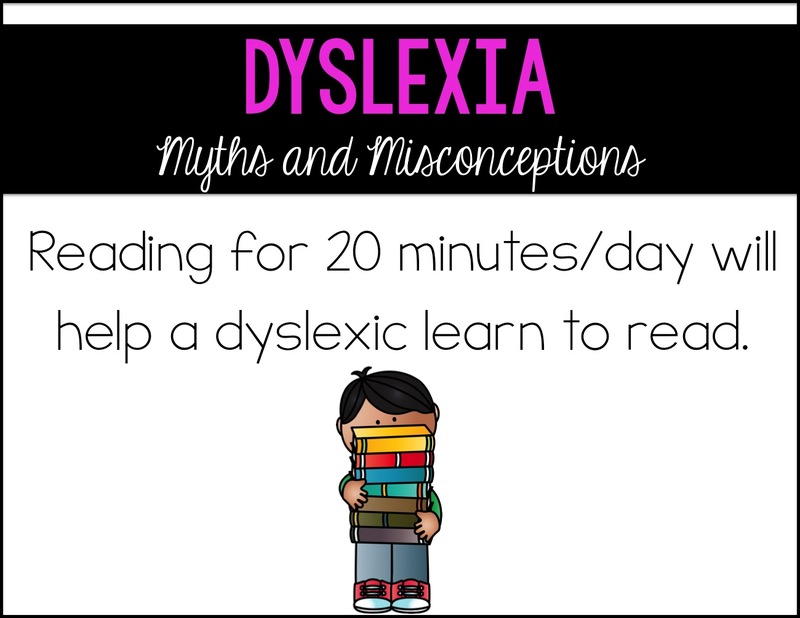 There is a distinct difference between activity in a dyslexic's brain and a non-dyslexic reader. 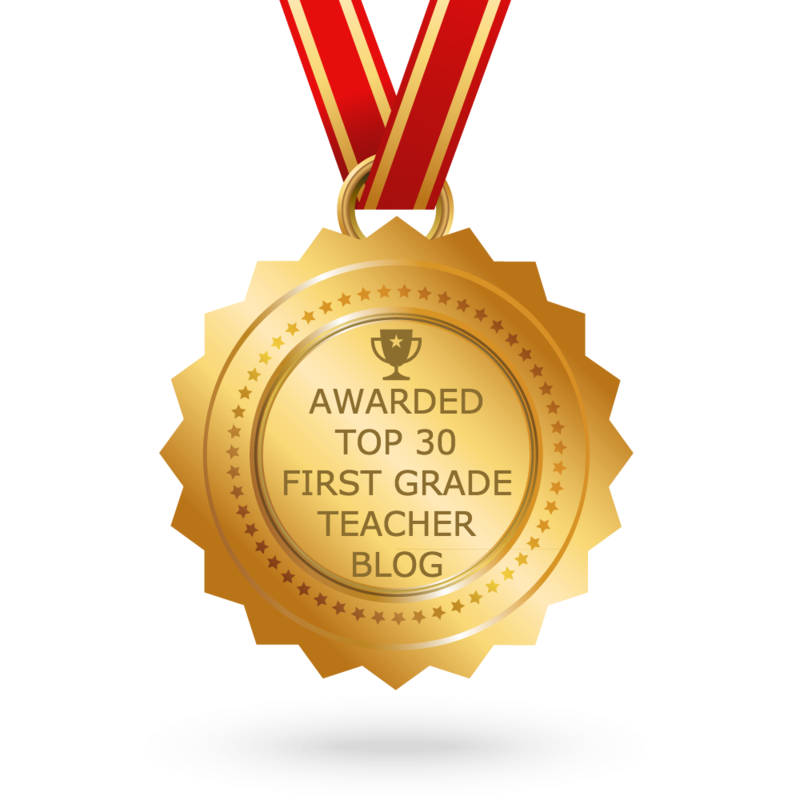 My next blog post will talk about the brain and reading. Accommodations are so important for our dyslexic learners. As I mentioned, they are bright and deserve to have access to the same information and learning opportunities. As teachers, we still want to remediate to teach these kids to read, but we also need to accommodate in the meantime to make sure they are able to grow as a learner in other areas. I hope this post was informative and helpful. I'll be posted again soon! Thanks Paige! So true about the b/d thing! It's so common, isn't it?! I am so glad your are doing this series! I think that Sarah has spent many hours researching the causes and the nature of the disease. 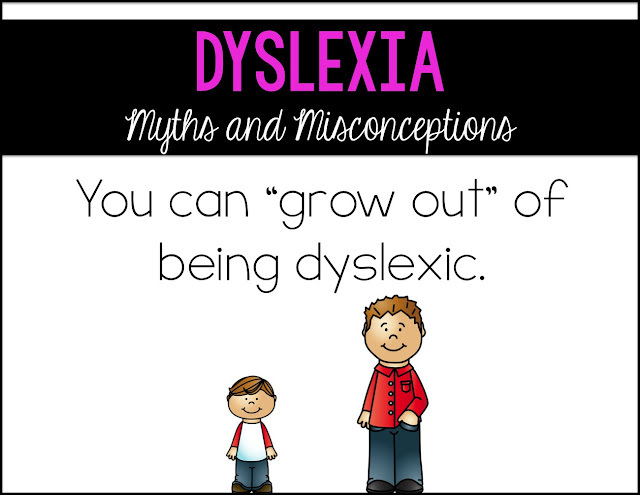 It is, in fact, sometimes frightening to realize how many kids can suffer from dyslexia. However, it is good to know that there are teachers like Sarah who don’t want to give up to the fear, but know the enemy by its face instead. I thank you for the article, it was extremely informative for me. You should totally write persuasive essay online and help more parents and teachers with your through research. This is really informative. I even shared this with a big friend of mine. She has a daughter and afraid of this. I feel her. Thank you very much, Sarah you gave my friend a path to go if something would happen. Thank you again for this amazing information! Thank you for posting this information. It was straight-forward and summative.